Update: Tagesanzeiger cited the wrong figure for Austrian money, we believe; the version below is corrected. 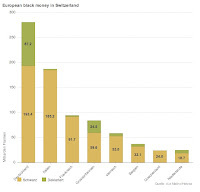 The Tax Justice Deutschland Blog has picked up on a new report by the Geneva financial research firm Helvea, which estimates that Switzerland has about 500 billion Euros of "black money" (Schwarzgeld, in German) stashed away. Last September Andreas Missbach of the Berne Declaration in Switzerland also did a calculation, which he wrote up for TJN, estimating that Switzerland hosted 2.5 - 4.0 trillion Swiss Francs in foreign private wealth (later the Swiss Bankers' association estimated 2.15 trillion) which is not incompatible with the Helvea estimate of 862 billion of total European money (including declared money). Missbach cited estimates for the proportion of the CHF 2.5-4 trillion that is undeclared ranged between 30 and 90 percent - leading to a total estimate between CHF 645 to 3000 billion range of dirty money. Note that this is an even bigger figure than earlier estimates by TaxAnalysts concluding that at the end of 2006, there were $607.4 billion of assets in Switzerland's financial sector beneficially owned by non-Swiss individuals who could easily be illegally avoiding tax on those assets in their home jurisdictions; plus $356.1 billion in fiduciary deposits. The new Helvea figure, note, is bigger than the TaxAnalysts figure: it is in higher-valued Euros, for a start, and it refers only to European dirty money. The study does not seem to be online, so this is culled from newspapers: Switzerland's Tagesanzeiger (original German version here), and Austria's Standard (original German version here. Also astonishing is the sheer rate of crime: of over 850 billion Swiss francs stashed in Switzerland, only 16 percent were declared, the newspapers report. And a truly astonishing 99 percent of Italian money in Switzerland is undeclared. For TJN's range of estimates for the various forms of dirty money around the world, and country by country, click here.